Save 10% Off Spytech-Web Internet Spy Software! Who Reads the Fine Print Down There? You Do, That's Who! Congratulations! Most people won't look at our fine print, but for some reason, you did! During checkout of any product, use coupon code Take10 to save 10% instantly on any purchase. The more licenses you purchase, the more you'll save. Take advantage! Here's the catch (there's always a catch), this offer is intended to remain secret and only available who click the "Feeling Lucky" text on the footer of 1 Spy Software. Please do not share this offer with anyone. Below we list our most popular spy software. Write down the coupon code above (in bold red) and take it with you. Use it during your checkout for instant 10% off savings. 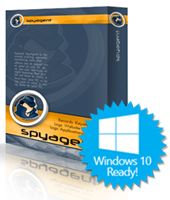 SpyAgent Spy Software - 10% Off! Our Top Selling Spy Software Product! SpyAgent sets the bar with its award-winning, computer monitoring that creates the ultimate all-in-one spy software. SpyAgent spy software logs everything users do including all keystrokes, emails, applications, windows, websites, internet connections, passwords, chat conversations, and even screenshots. SpyAgent spy software can run in total stealth, defeats popular spyware detectors, and provides website, chat, and application blocking abilities. Realtime Spy Remote Software - 10% Off! Our Top Selling Remote Monitoring Solution! 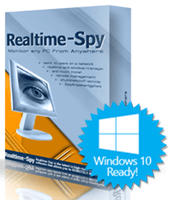 Realtime-Spy is the latest in cutting-edge remote spy software monitoring technology that allows you to monitor ANY PC you own from ANYWHERE. Realtime-Spy is remotely installable (no physical installation needed), and its activity logs are accessible from anywhere - regardless if the remote PC is online or not. Realtime-Spy logs all keystrokes, websites visited, applications ran, e-mail activity, chat conversations, screenshots, and more - in complete stealth. Realtime-Spy can also show you what users are doing, and typing, in real-time. NetVizor Network Monitoring - 10% Off!